We sell wire online in 10 and 25 lb spools. 0.103 X 0.017 inch Galvanized box wire 25 lb spool. 0.103 X 0.020 inch Galvanized box wire 10 lb spool. 0.103 X 0.020 inch Galvanized box wire 25 lb spool. 0.103 X 0.023 inch Galvanized box wire 10 lb spool. 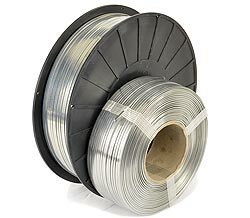 0.103 X 0.023 inch Galvanized box wire 25 lb spool. 0.103 X 0.028 inch Galvanized box wire 25 lb spool.